We’re proud to announce our new product – Video Analyzer. 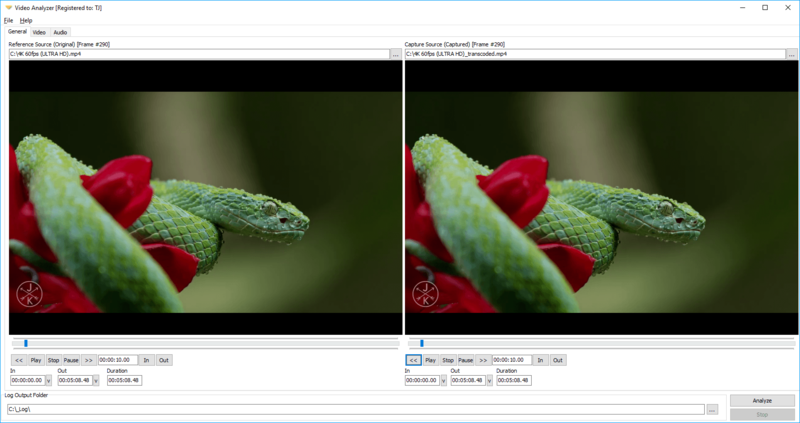 The solution performs file-based quality analysis of two media files on frame-by-frame basis. Video Analyzer compares and analyzes each two subsequent video frames and calculates MSE (Mean Squared Error), PSNR (Peak Signal Noise Ratio) and overall difference. The solution also checks the video frames for black and freeze frames anomalies. The audio frames are compared and corresponding MSE, PSNR and overall difference in percentage is calculated, along with the separate channel peak and volume. Video Analyzer provides the ability to compare the quality of two video and audio streams. both audio and video streams. The Video Analyzer performs faster than real-time media file analysis. The speed is only limited by the system’s resources. This way the solution can run on any i7 or Xeon-based systems and it can achieve speed of 20 times faster than real time duration of the files. The solution allows full media analysis of the entire media file duration. It also allows selection of in and out points for analysis, where only the segment of interest can be assessed. The Video Analyzer generates graphical charts which can be observed in real-time, while the media files are still being analyzed. Once the solution finishes the analysis it generates a HTML and/or CSV log files. The HTML log files are preferred for manually investigating the quality deviation along the analyzed media duration. While the CSV log files are used as an input for any automated workflow. You can find a demo log file here. The Video Analyzer product comes with some of the most popular codecs integrated, such as MP4/QuickTime, MPEG-2, MXF, AVC/H.264, HEVC/H.265, MPEG-2 Video, MPEG Audio, AAC. Along with the compressed formats the solution offers raw video analysis of YUY2, RGB32, UYVY and HDYC raw formats, through its raw video insertion mechanism. We believe the Video Analyzer solution will be very useful in any manual or automated workflow which includes file-based video encoding and/or video transcoding, where the quality of the produced video content is important. Learn more about the Video Analyzer’s awesome features here!